ET Bridal is a free and premium unique Wedding WordPress theme that targets for wedding store. The Wedding WordPress Theme is on-trend and fashionable, giving you the opportunity to create a web presence that is both professional and totally contemporary. Your website will not only showcase your products, it will also capture your creative ideas and convey them to brides and grooms to be. 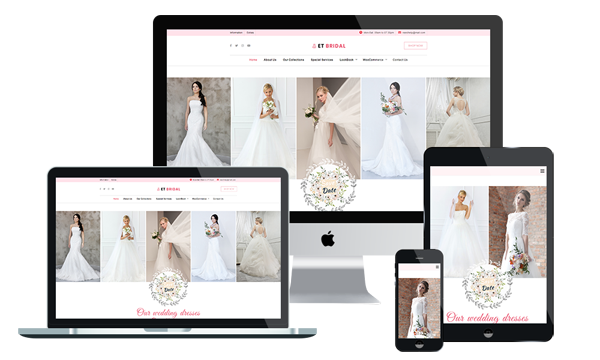 In addition to the great selection of wedding store website templates on offer, you will have access to a range of widgets and modules via your personal CMS Panel. You’ll even get great features like cross-browser compatibility and great galleries, all of which allow you to tailor your site to suit your business’s needs and show your products in their best light. The Wedding WordPress Theme can be easily customized to enhance your online appeal and to deliver a more satisfying user experience depending on the products or services you offer. These templates are very easy to customize and run on all major web browsers. You don’t need to learn how to code.